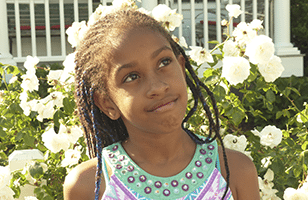 Meet Antoinette, a rising sixth-grader at Holy Cross School. Antoinette loves gymnastics, her mother, and is her own role model. This spirited young student has dreams of becoming an astronaut and is determined to continue her education at a good high school and university. A: Math, because I get to learn new things and more numbers, also increases the chances of getting into a good high school and college. A: No one. I feel like being my self is the best, and you should always be yourself and nothing more. Q: What do you want to be when you grow up? Why? A: I want to be an astronaut so I can have lots of money to take care of myself and my family. A: I’m looking forward to being the best student I can be so I can get a higher education. A: That she stays focused on a path to greatness and has the ability to make smart choices in life. A: Holy Cross has a robust curriculum, caring faculty, and Antoinette has created a circle of positive peers around her. A: Antoinette has always attended Holy Cross and she is completely happy there. The classroom sizes have gradually increased each year, and fortunately the school remains consistently good at managing classes. I believe that the faculty genuinely encourages every student to be their best. A: Relieved! As a single parent $1,000 is a major impact on our household budget. We live check to check like many people and lessening Antoinette’s education expense is a big help. A: I didn’t grow up in a family that valued education. I had the learn the value myself as an adult. I raise my child to understand that prioritizing education is the only way to get you to where you need to be in life. Sending her to a good elementary school is laying the foundation for a lifetime of valuing education. A: I think it’s worth every penny to send my daughter to a better school, and this scholarship makes it financially within reach. “Apply every year until you get picked” is what I would tell someone. I think there is a good chance that within K-8 , if someone is applying every year they are going to get picked sooner or later.